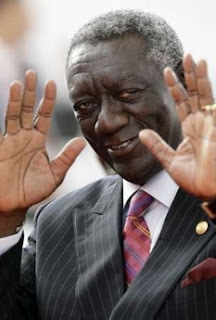 President John Agyekum Kufuor, Chairman on the African Union (AU), has called on the European Union (EU) to show genuine appreciation for the socio-economic and political concerns of Africa as the two continents looked into the future together. "To secure dignified places in the on-rushing Global Village, Europe needs Africa as much as Africa needs Europe", he said at the opening of the EU-Africa Summit in the Portuguese Capital, Lisbon, on Saturday. He said both parties must therefore be committed to promote and sustain economic, cultural and humanitarian cooperation, recognizing Africa's rights to integrate itself into the world economy in terms of trade, investments and capacity building on basis of its sovereignty. President Kufuor and Mr Jose Socrates, Prime Minister of Portugal, whose country holds the EU Presidency, jointly chaired the two-day summit, which was designed to open up new horizons for partnership. Peace and security, development, good governance, migration and climate change, were the main issues at the centre of the agenda for discussion by the 66 Heads of State and Government present. It comes amidst the growing Chinese investment and influence in Africa and the increasing recognition that the continent is no longer "Europe's private hunting grounds." President Kufuor said the real significance of the meeting should be to build strong foundations for a new relationship based on mutual respect, trust and true commitment to pursue common and mutual interests. He said previous partnership arrangements had been slow to come up to expectation but this time "Africa has come here believing that it can be different and for the better." He said with its vast untapped resources, Africa was the new business frontier that must be explored and that as a partner, Europe could bring on board in this venture its mature scientific and technological know-how and significant capital. This must be the rationale for the new partnership between the two for purposeful cooperation. President Kufuor also spoke of the need for the adoption of an action plan for the implementation of their joint partnership strategy for the benefit of their peoples. For efficacy, he suggested that the process of implementation must involve critical public institutions, the private sector and civil society stakeholders, to ensure an all-inclusive ownership. Prime Minister Socrates said it was time Europe and Africa wrote a new page in their relationship through frank and open dialogue with "no taboos." He said the summit was one of equals, adding that, "We are equal not just in our human dignity but also equal in terms of political responsibility." He said Europe wanted a partnership with Africa based on shared vision and mutual respect: that would defend Africa's priorities and provide solutions to its problems.